Engaging, relevant, challenging and significant. After recent training courses with Kath Murdoch and Lynn Erickson, I have thought deeper about the purpose of Central Ideas. For years I have heard many PYP teachers arguing about what makes a good Central Idea or that Central Ideas are often too broad or inaccessible for students (especially from lower primary teachers). I have often seen Central Ideas beautifully displayed on classroom walls, but have never really been used or have been used ineffectively. It ends up being wasted space, where a more interactive use of ‘the third teacher’ would be more beneficial for the students. I have also witnessed many ‘unpackings’ of Central Ideas. This usually ends up being a mind map discussion with the class and is ultimately a vocabulary lesson. With that box ticked, the teacher feels that they can move on to the content of the lesson, occasionally (or not at all) dragging the Central Idea back into focus, reminding of the students that they must show their understanding of it when the summative task is shared with them. At the end of it all, what is the use of a Central Idea? Why do school administrators insist that they must be present in the PYP classroom? I suggest that the Central Idea is purely for the teacher, with the main purpose to keep the teacher on track – ensuring that they try to help the students reach that conceptual or enduring understanding throughout the unit. One thing that bugs me about Central Ideas being ever present and referred to is that it stifles any chance students have in making their own generalisations about their inquiry. The teacher has already made the generalisation for the students, so why should they even bother?! One of the goals of concepts-based teaching is to develop the skills and knowledge within students so they can transfer them and make their own generalisations and understandings about the world. Are we undoing a student’s great thinking by limiting to a teacher’s perspective? I have been experimenting with teachers with this theory and have played around with stripping down Units of Inquiry to the core concepts that we want the kids to understand. Instead of spending time going through the motions of ‘unpacking’ the Central Idea, the teachers have been spending time ‘unpacking’ the Key Concepts selected for the unit (example). Once the students are confident with the Key Concepts, they are then used as the lenses needed to look at the related concepts planned for the unit. The students don’t have to try to understand a long, convoluted sentence. They just have to understand two words (a Key Concept and a related concept). This approach has been supported by one great idea that I gained from a recent Lynn Erickson workshop: that is to develop stronger teacher questions. The first step is to develop strong Lines of Inquiry. Instead of using a key word or phrase for a Line of Inquiry, develop Central Ideas (or enduring understandings) for the Lines of Inquiry. These Lines of Inquiry are not to be given to the students, burt are to be for teacher planning only. Use these stronger Lines of Inquiry to make stronger, conceptual teacher questions (using a ‘how’ or ‘why’ question). These questions should be displayed in the classroom. These are the questions that help guide student inquiry. They do have to be used wisely though. Develop factual questions (‘what’, ‘when’, ‘who’, ‘where’ questions) to be the basis of learning engagements. Develop these from the conceptual questions. Again, this develops stronger inquiries to scaffold student thinking. Using the knowledge developed from these factual questions allows students to try and answer the conceptual questions in any form they wish to show how. The factual questions also allow teachers to feed in the content needed for the inquiry. An example can be seen here. Allowing the students to answer conceptual questions allows them to think deeper and allows these teacher to see if the student is reaching the conceptual level desired. At the end of the unit, using the student’s conceptual understandings, allow them to produce a generalisation summing up the unit. This will require some scaffolding through a thinking template or discussion. I have seen some success with this approach, which will only grow stronger as the students have more chances to make generalisations. The first attempt of generalising from a group of 6-year old students can be viewed here. The teachers shared their Central Idea at the end of the unit, prompting further debate with the students and the tweaking of their understandings. Students were also given an opportunity to display their understandings of their own generalisation in any form they chose (great summative task). The various teachers involved commented how this approach freed up their teaching, allowed for deeper understanding of Key Concepts and related concepts and promoted true student inquiry. It may be time to see for ourselves who actually needs a Central Idea. Maybe the Central Idea is best kept on a planner. We are about to start author studies here in my Kindergarten class, but first, we took some time to tune in. The notion of tuning in is often misunderstood. Some teachers regard tuning in as initial explorations of a unit’s content or concepts, which is not altogether incorrect- provoking student interest and identifying personal connections is a necessary component of the start of a unit of inquiry in order to help students begin their journey to deep conceptual understandings. However, teachers must also tune in to their students– What do they already know? What do they think they know? What do they want to know? How is this relevant to their lives? This valuable information will expose misconceptions, reveal student interests, uncover students’ own life experiences, and encourage questions, all of which should, in turn, guide the direction of future inquiries. Kath Murdoch (the well-known inquiry rock star) suggests the teacher’s primary role during the tuning in phase of inquiry is to “… stimulate, question, record, mediate and, above all, to listen.” (p.12). With this in mind, I started the process of tuning my students into the concept of authorship via a simple thinking routine, whilst I tuned into them, their prior knowledge, and what may interest them as we learn about various authors and their work. First, we defined what an author is. The general consensus was that an author is someone who writes a book. 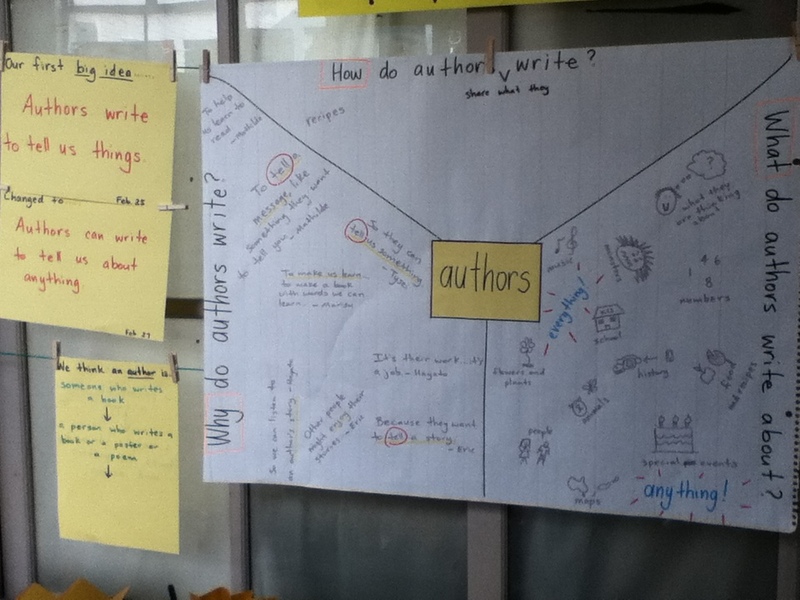 Next, the students brainstormed what authors do. It was a slow start for the students (“It’s their work….. it’s a job”), but once the first student mentioned that authors write to tell us a message, “….like something they want to tell you…”, then the ball really got rolling! – To help us learn to read. – Because they want to tell a story. – So they can tell us something. – So we can listen to an author’s story. – Other people might enjoy their stories. 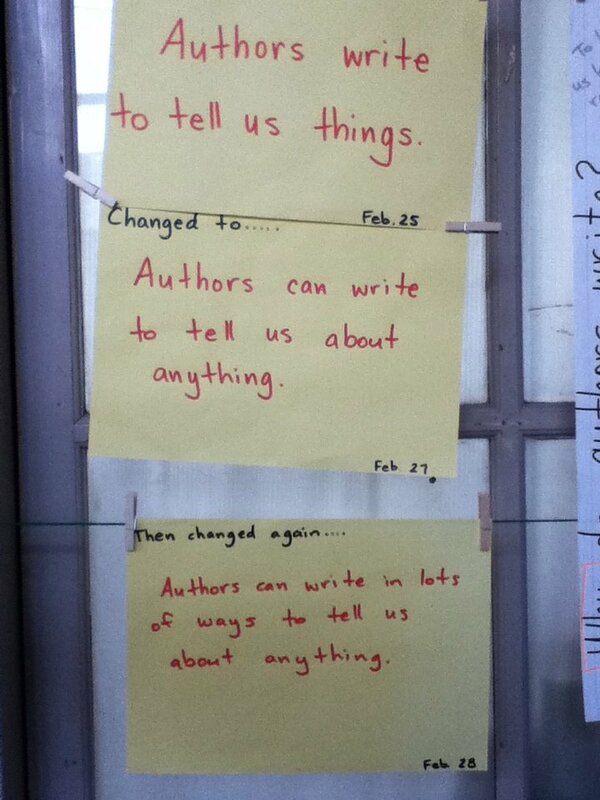 The students noticed that a lot of them had the same idea, that authors write to tell us something. This is when we made our first generalisation, a ‘big idea’- authors write to tell us things. It was at this point that one student called out, “Authors write books and poems and posters, too!”. 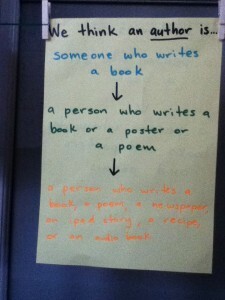 After lots of excited “Yeah!” comments were made, we all agreed that this should be our new definition of ‘author’. 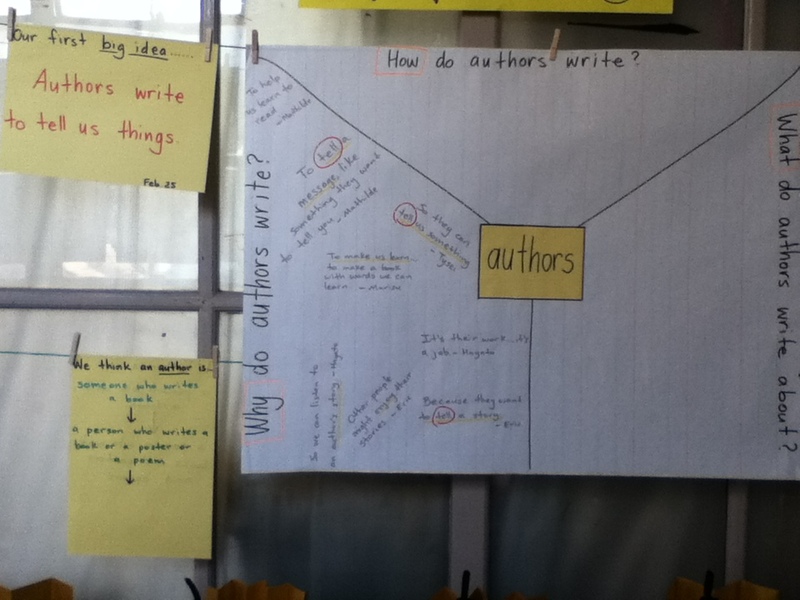 We started to think about the different things authors write about. It was another slow start, but after I asked the students to think of their favourite books and what they were about, then the ideas flowed! 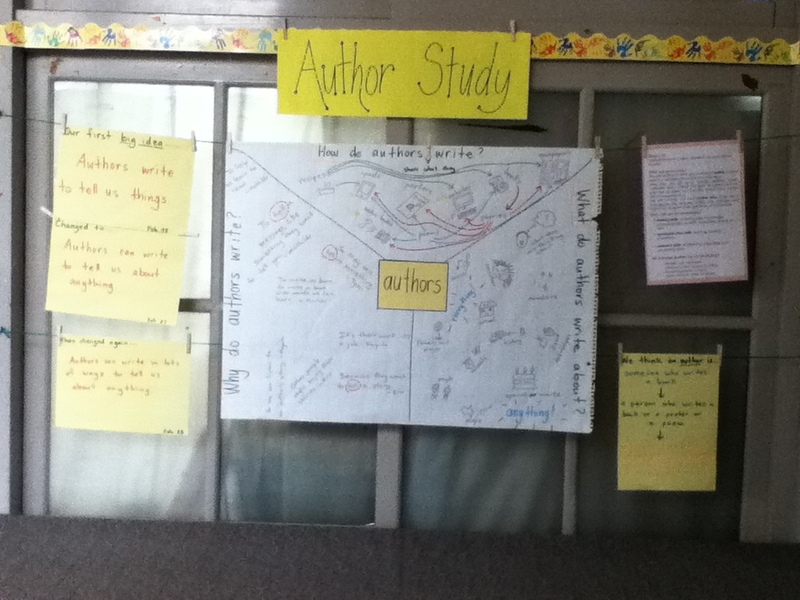 I especially like the comment that authors write about “….what they are thinking about.” When I asked this student to elaborate, he replied that they write about what they like, which another student connected to the students’ own published books that are displayed around the room. This led the students to the realisation that they are authors! Whoa! – But we can put the things that authors write about. – Yes! It tells us more information. It was at this point that I jumped in and asked if we could say all the things authors can write about in one or two words. Silence. I suggested the word anything, then another student suggested everything. 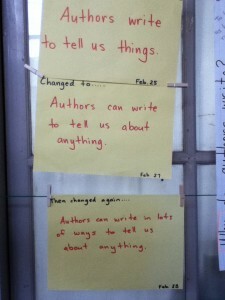 One student called out, “Authors can write to tell us about anything!”. We had our new ‘big idea’. I changed today’s question from ‘How do authors write?’ (waaaay too abstract) to ‘How do authors share what they write?’ (much more focused on what I wanted the students to think about, which were the different ways we can access and read authors’ work). One student had mentioned recipes yesterday, and I explained at the time that recipes were also a way authors could share what they were thinking about and what they liked, so it was added to today’s section of the poster, too. When we started today, the word ‘recipe’ seemed to prompt the students’ thoughts immediately. Students got into the flow of this idea straight away, which surprised me as the relatively straightforward questions from the past two days seemed to stump them at first. Sometimes they just need a little nudge! Once we had thought of different ways authors can share their writing, we made connections between them- can you read a recipe in a newspaper? On an iPad? How about via an audiobook? The students realised that there are many different ways authors can share their writing, and many different ways we can read about things, not just via books. One student suggested we change the definition of author again to include all the different ways authors can share their writing…….. Which brought us back to our ‘big idea’. Did it need to change again? The students all agreed that they wanted to change it to include today’s new information, so we ended up with……..
We wrapped up by stepping back and marveling at how our understanding had changed over the past few days as a result of thinking about new ideas and making connections between these ideas. No student questions came up throughout this entire process- are they interested in author studies? I’m not entirely sure, but my next step is to actually ask them! Once the ball gets rolling, I anticipate my students will start to ask lots of why and how questions. In the meantime, we’re going to start with Dr. Seuss as he is a class favourite. They seemed to enjoy the process of creating generalisations, what we are calling ‘big ideas’- I wonder if we can make generalisations about authors and their work? But for now, we are tuned in and ready to start finding out about authors through author studies! Murdoch, K. (1998). Classroom Connections: strategies for integrated learning. Eleanor Curtain Publishing: South Yarra, Australia. What does effective collaboration really look like?